Now it's time to check in with Ani Maldjian, who plays Papagena. An alumna of Seattle Opera's Young Artists Program, Maldjian made her mainstage debut in the fall of 2007 as the First Priestess in Gluck's Iphigénie en Tauride; meanwhile, as a Young Artist, she was playing such roles as Serpina in La serva padrona, Nannetta in Falstaff, Rita in Donizetti's opera of that name, Trio Soprano in Trouble in Tahiti, Fire/Princess/Nightingale in L'enfant et les sortilèges, Lauretta and Ciesca in Gianni Schicchi, and an unforgettably Armenian Lillas Pastia from a tough neighborhood of Los Angeles in The Tragedy of Carmen. She speaks with us about Papagena, playing roles large and small, and working with dialogue and character voices. Just before rehearsals for Flute began, you were down in Portland for The Diary of Anne Frank, with Portland Chamber Orchestra, a role you’ve done several times before. Tell us about this opera, and what it’s like to portray Anne Frank. The Diary of Anne Frank by Grigori Frid is a one-woman opera, nearly one hour in length. Every word you hear comes directly from Anne herself, out of her diary. Most of the opera takes place when they are in hiding and spans the entire two year period they lived in the annex. The opera takes us through many emotions and experiences Anne went through, some of which include her fears, concerns, hopes, prayers and my favorite... the first time she falls in love. It's an amazing experience to portray Anne because she was such an extraordinary child, so ahead of her time and with an important message which still applies to us today. My favorite line in the opera is: "In spite of evil and fear, this world is still beautiful...and as for man...he too is good." Every time I perform this role, her spirit reawakens mine. I feel so lucky to have performed this internationally over the past four years. Papageno (Leigh Melrose) first meets Papagena (Ani Maldjian) when she's disguised as an old woman. Why does Papagena first appear to Papageno as an old woman? 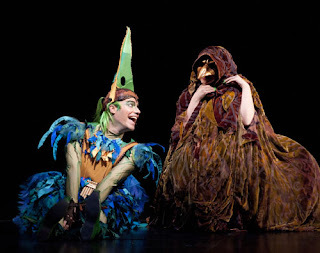 Papagena appears as an old woman to test Papageno's heart and to see if he will promise his love to her even if she is old and not so beautiful. Once he promises and she sees that he has a good heart, she reveals herself as the beautiful, young Papagena. He is happily surprised! 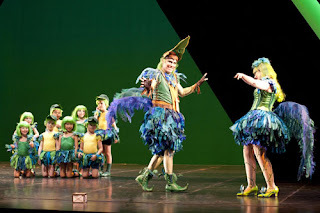 You’ve just done an opera (Anne Frank) in which you’re onstage the entire time; in Magic Flute, you have an extremely small, although vital, part. What are the challenges and rewards of these two kinds of roles? I think there are challenges to both sizes of roles. In a small role, you only have a few minutes to show your talents and to make an impression. So there's that kind of a pressure. But a larger role requires longer periods of focus, commitment, emotional and vocal stamina and you really have to be on top of your game for much longer. However, no matter the size of role I sing, I prepare in the same way mentally and give it my all. After all, I'm here doing what I love...PERFORMING! As Papagena the old lady, sopranos often do an exaggerated character voice. If you’re performing dialogue—particularly in a weird voice—is it easy to turn around a minute later and sing beautifully? I am doing a character voice in this production. I tried out many voices in my own practice (ranging from cartoony voices to screaming very high pitched voices). But as soon as I put on my costume and mask, the right voice naturally came out. It just felt right. I would say it's a high pitched voice that is a cross between an exaggerated old lady and and an evil cartoon character. It's really easy for me to switch into singing because I keep the speaking sound supported as if I were singing and I try not to put too much pressure on the vocal cords. Papageno (Philip Cutlip) and Papagena (Ani Maldjian) celebrate their new love and family. We hear you're acquainted with Serj Tankian, who's playing with his rock band System of a Down at Key Arena on May 13. Yes, he's a friend of mine and I've sung on a couple of his solo albums. I'll be singing as Papagena the night he's at Key Arena, though, so I'll miss his concert!